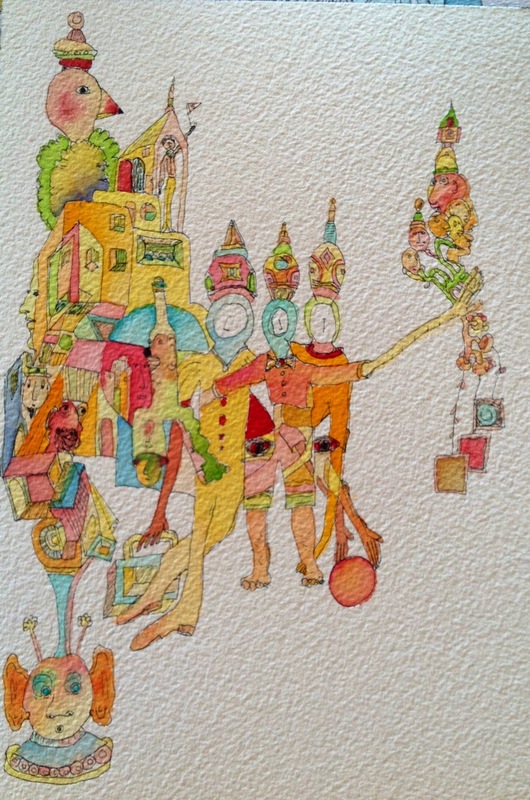 This entry was posted in Uncategorized and tagged art, artist, Going to Goa Blog, painting, Scott Morgan, traveling with cancer, watercolor. Bookmark the permalink. Hi Scott – Am loving the blog – you and Katy are more inspiring every day. Are you going to the school reunion in New Delhi? Thank you! No we learned it is not a reunion, merely a dinner, and thus not for us. AWESOME art as usual keep sending ! I love the clock heads ! Wow…the more I look, the more faces emerge! Is that alien at bottom dreaming this up as it all appears to stream from his head? The figure on top of the bird. Is heScotton his piles of pillows? Or the Princess and the pea? Do I see three peas between those mattresses? And who is the bearded face with darker skin down there on the left? I feel like he appears in many of these paintings. I just love getting to see these paintings, which offer a glimpse into your imagination while also giving many minutes’ pause to observe and reflect. Keep the brushes full, and the images flowing! Enjoy the warmth. It is about 34 here at the beach. Kim flies to St. Louis today for a meeting and home tomorrow night. She just told me it is 20 degrees there. As you both remember Kim is a financial planner with Edward Jones. Two weeks ago Barron’s selected her as one of the top 1,000 planners in the United States by state. It was published in the magazine and is also online listed under North Carolina on their website. Better jump in the shower as Kim leaves at 10:30. Wow, Charles & Kim– Congratualations! Thats pretty exciting for Kim!